Last week, I actually talked to someone who didn't know who Link Wray is/was. I had played "Jack The Ripper" on my show, the version from his 1974 live session at the Record Plant in Sausalito, California, a session played live to 2 track and broadcast live on KSAN. It was recorded during Link's meanest and leanest period, musically. He was touring to support his "Bull Shot" album. Anyway, this guy wanted to know if it was new and if this guy had any other records out. When I told him the recording was from '75, he almost choked. When I told him Link had been recording since the fifties, he further balked, and when I told him he had just played in the area at the age of '73, he was incredulous. 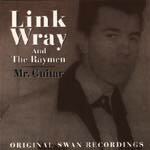 Link Wray is a rock 'n roll original! There's no doubt that Link Wray influence one hell of a lot of surf guitarists, and others too. Norton Records' 2 CD set of the complete Swan recordings is nothing if not essential. It contains some nice surfisms, and some of the raspiest dirtiest nastiest guitar ever. What instrumental collection can hold it's head up without Link's "Rumble" or "Jack The Ripper"? But, wait, there's a whole slew of tracks (63 if you count 'em), and hardly a bozo in the crowd. Link was one of the early players to adopt Bo Diddley's trick of slitting his speaker cones with his pocket knife to get a raspy pre-fuzztone sound. He nearly invented the garage genre with his raw delivery, which was completely out of step with most of his instro contemporaries like Duane Eddy & Dave Yorko. But, to the surf stuff. Link didn't use reverb much, but when he did... oh mama don't you cry! Just feel the salt water in "My Beth" or "Cross Ties." Yum Yum! Super fast double picked guitar assault on Bo Diddley's namesake song. Talk about your chunky fast guitar rages, this is a monstrous number made available for the first time in the US on this CD. What Link would have done to a surf band is anyone's guess, but this track suggest that he would have redefined the genre. What a pummeling track! Also called "What Happened To The Waltz." Deep twang and edge, rolling drums, and a fast progression on the low-E combine for a fifties primal twang monster. It has a big sound, and lots of energy. Beautiful guitar twang, moody island imagery, and plinking piano over a slow dance backtrack create a finer romantic number. Very pretty, and oozing sensuality. The rolling tribal drums are very cool, organically grown jungle rhythms under the grodie Link Wray long note guitar voicing. A very fine track. Instrumentally delivered, this is a strange amalgam of Presleyisms, pre-surfisms, and vocal chorus with handclaps. The thundering drums add a coolness. Interesting bit of history malformed by the Linkster. The surf rhythm guitar under the Link Wray raw slit-speaker sound is very cool. It's a basic progression, dark and gloomy, with tons of ugly beauty, accented by stinging whammy cords, and warbling tremoloed fuzz. What a bizarre sound. Vibrato rawness, cheesy organ beneath, and a basic beat. The melody line is minimal, but the idea is interesting. The tribal drums are cool too. The Gold Finger chords introduce a fine near surf almost Italian portrayal of this Mediterranean track. This is a glorious number, with nice changes and varied elements that work really well together. A fine track. A cool driving song, found in your rear view mirror, with touches of "My Beth," but without the reverb. A developing song with some really cool stinging playing. Another average Link Wray track. Tape delayed guitar, and a more spatial sound, this is more ringing that the earlier versions, almost surfy in texture. Grindy and damp. A fifties B-side sorta thing, progression in search of a melody. An almost MOR Three Suns kinda feel, echoed drums simulating a brushed performance. The guitar is smooth, but the track is unremarkable. Smoother more polished barnyard rave up, feathers flying and eggs breaking everywhere. Buzzy good fun. Some double picking and some Les Paul, all very pretty. This traditionally recorded instro gains a lot under Link's artful pluckage. very nice track. I wonder why the surf bands didn't pick this up? A different more edgy guitar sound, and harmonica, deliver yet another version of this classic. Instrumentally yours, but not very special. Tastefully played version of this film theme. It's quite pretty, and so very melodic is a sappy fifties love song kinda way. A Texas cowboy kinda song, dripping chuck wagon aromas and western guitar tones, over a rolling C&W backtrack. It almost cries Buck Owens, but has more guts, of course. A fine track. Instrumentally, this is an OK melody, but the arrangement is nothing special. The performance is fine. So-o smooth MOR guitarology, just crying out for the soul of Buddy Merrill. Actually, Buddy never had this much soul. It's quite nice, just not very inspiring. A horn overdubbed - and isn't it out of tune with the rest of the track? Really strange sounding. Can't say I wanna hear it again. It's like a high school marching band... nope, not for me.